As the new Mayfair edition of Agricola will be back on our shelves this week, I took a few minutes do a comparison of the previous Z-Man edition to Mayfair's new revised edition. I find that the new Mayfair edition is really well done. Mayfair Games' edition features animeeples in the right shape for the sheep, wild boar, and cattle. The resource cubes have been replaced with resources in their various shapes. Even the family member disks have been replaced with large farmer meeples with cowboy-looking hats. These things don't change the game play, but they are cool. The game play remains basically the same as in the older version. One significant change is in the decks of improvement and occupation cards. Rather than 3 separated decks of each type, the card decks have been pared down to a deck of 48 minor improvements, and a deck of 48 occupation cards. Some of the cards have been modified and renamed, but they represent the cards players most often wanted to play. There is also a change in one action space in both the 3-player and 4-player game to a 2nd space where an occupation card may be played. This change plus the addition of 3 small action boards that can be incorporated into the game should make this version more accessible to a wider audience. The first of these additional action boards is for use in a lighter version of game play with player counts from 1 to 4 and is a Side Job of building a stable and/or baking bread. The second additional action board is for use in a 2-player game and adds 4 possible action options. And the third additional action board is for 3 or 4-player games and adds 2 possible action options. It's not in the rules, but players can add these boards at will to give players more options. 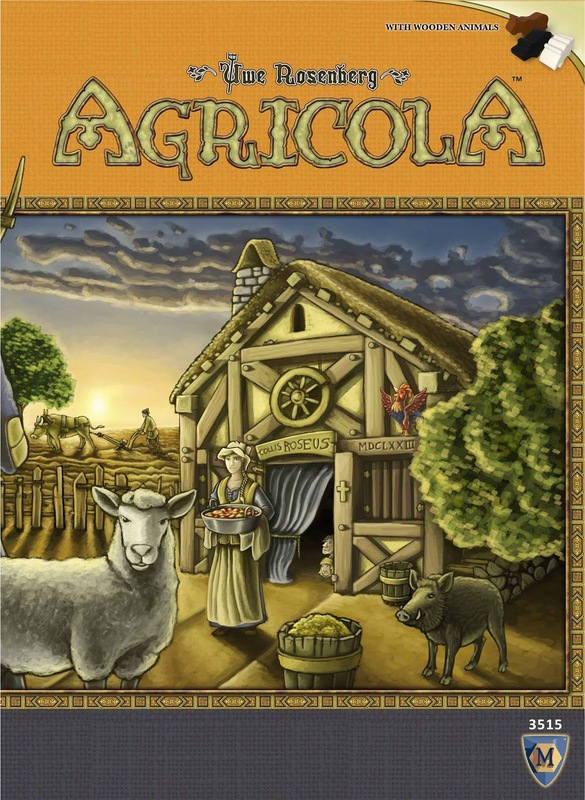 For those who prefer the Agricola we have all played and loved, put those new option back in the box and play the same challenging game we have played in the past. At least now when our meeples need a begging card, they can get it wearing a cool cowboy-looking hat. 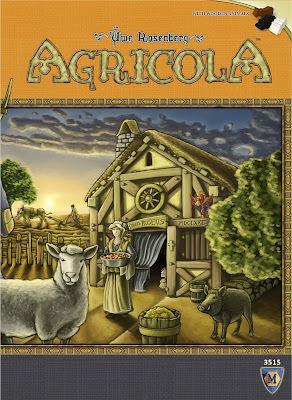 We have an open copy of Agricola: Mayfair Revised Edition available in our Demo Games Library for you come in and try.